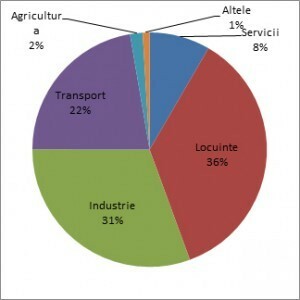 According to the statistics institute Eurostat for 2010 the housing sector in Romania ranks first on the energy consumption sector. 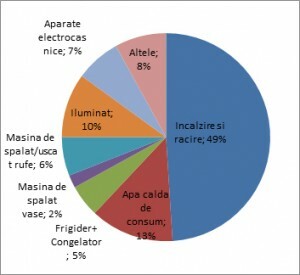 Inside them the heating and cooling part is the largest consumer of energy representing 49% of energy consumption, but any remaining part representing 51% could not ignore it dividing it between domestic hot water 13%, Refrigerators / Freezers 5 %, 2% dishwashers, Washing Machines 6%, 10% Lighting, Appliances 7% and Other 8%. The kitchen is equipped with the most space and consuming appliances and part of a consumer hot water is important in a home, so we should ask ourselves how we could reduce this consumption. First, we should make a list of energy consumers and producers who have a place in these spaces. Kitchen appliances are essential in everyday use so we can not miss them, so the best way to reduce them is to choose some with greater energy efficiency. Currently, energy labels are covering over 10 product groups and its scope is expanding gradually. The main element of the label is a product falls within one of the seven energy efficiency classes, designated by the letters A to G.
If necessary, it can use three additional classes (A +, A and A +++ ++), in which case the lower categories will become F, E, or D, provided that the market does not exist in the low class products thereof. The label also includes information on the consumption of energy and other specific parameters such as size / capacity, noise, water consumption, etc. Due to the energy label, consumers can make choices in full knowledge of the facts. Access to accurate, relevant and comparable information on the energy efficiency of a product and its consumption of energy and other resources can influence purchasing decisions, thereby contributing indirectly to improving the overall efficiency of products. Heat from cooking is a welcome source of heat in the winter and also an unwelcome one in summer, based on these considerations we found also these days the summer kitchens in which is avoiding the overheating. If we do not have this possibility is the best way to escape through a hood as fast as it can the volume of hot air and saturated steam. 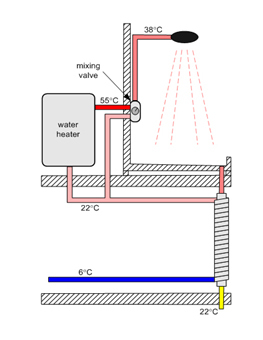 During winter air is more dry, the heat and steam could be useful, in exchange they are in most cases associated with the smell of food which can be filtered by activated carbon and the heat can be redeem itself with a heat recovery ventilation system – but do not forget that the hood can not be connected directly to the ventilation system with heat recovery without prior filtering of fats dissolved, while they have a tendency to clog the heat exchanger. Natural lighting of course remains the most effective and the most pleasant of all times of the day but we also have shorter or longer days depending on the season in which we are bot benefititing from it and have to make use of an artificial light source. Their effectiveness determin a lower power or increased consumption depending on the type. 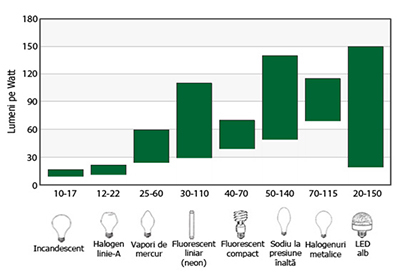 Incandescent bulbs in theory were withdrawn in 2012 according to European directive which started their withdrawal in 2009. 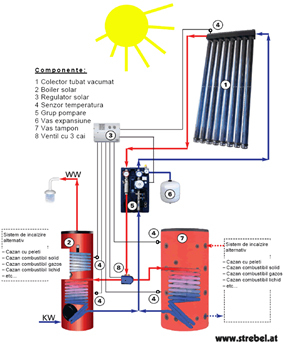 Hot water implies a considerable energy consumption, is generally produced with boiler fueled by gas, electric or solid fuel but may also occur through the use of renewable, for exemple solar panels. This solution provides us with an efficiency of 30-60% and reduces the costs with these percents and especially so if we do not have a solar panel or in the winter, during which diminishes the effectiveness panels. In afara de caldura inmagazinata in apa gri se poate recupera si apa gri in sine rezultata din spalatul vaselor, spalatul rufelor, si alte activitati din bucatarie. Greywater is also an indirect energy consumption by the need of purification before inserting it into an emissary. (Creek, river) This consumption tax is paid by sewage or common charges in the case of collective dwellings. 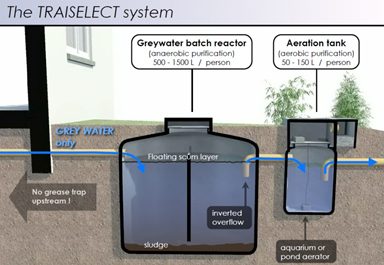 If we intend to build a single-family homes or multi-family (duplex or row) gray water can be purified easily and can be used both for watering the garden and rinsing WC – avoiding rinsing them with clean water when millions of people suffer from lack of water or because of contaminated drinking water. Whether it's a building or function attached to it, both for energy and in the case of drinking water, specialists in design (architects and engineers) are required to know and comply with legislation but also the possible evolution of subsequent to anticipate their changes. If there is still no concrete legislation on a particular topic, like reusing gray water or recovery the heat to draw attention of beneficiary to these possibilities. The beneficiary has at least the moral to draw attention and seek the laws in force in the project and must respect the project within the execution because the generally excessively high maintenance costs of a building is actually "the fine you pay for design and / or erroneous execution ".